A Family Prayer is a collection of songs that testify to the value and wealth to be found in communal endeavour, and to the joys and pains of a faithful spiritual walk. Executive producer Donald has personally overseen the album's concept and direction. 6 - Can You Stand The Rain? :A Family Prayer is a collection of songs that testify to the value and wealth to be found in communal endeavour, and to the joys and pains of a faithful spiritual walk. Executive producer Donald has personally overseen the album's concept and direction. The Murrils is a six-member, all-sibling group from North Carolina, which has literally spent its life, from earliest childhood, singing, playing, recording and performing together. Without even trying, The Murrills possess all the trademarks of family-knit gospel music: powerful leads, indelible harmonies, and a vocal synergy second to none. It's a dynamic that all six siblings - Roger, Arnetta, Donnell, Andre, Darwin, and Damion - are quick to attribute to their indefatigable mother, the late Janie Rogers Murrill, a tireless leader who instilled in their children a passion for Christ, music and the souls. 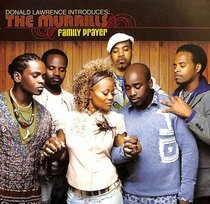 After a long stint as members of Gospel luminary Donald Lawrence's acclaimed and nationally renowned Tri-City Singers in which sister Arnetta Murrill-Crooms was a regularly featured soloist, the Murrills released their debut solo album, Family Prayer in June of 2008.